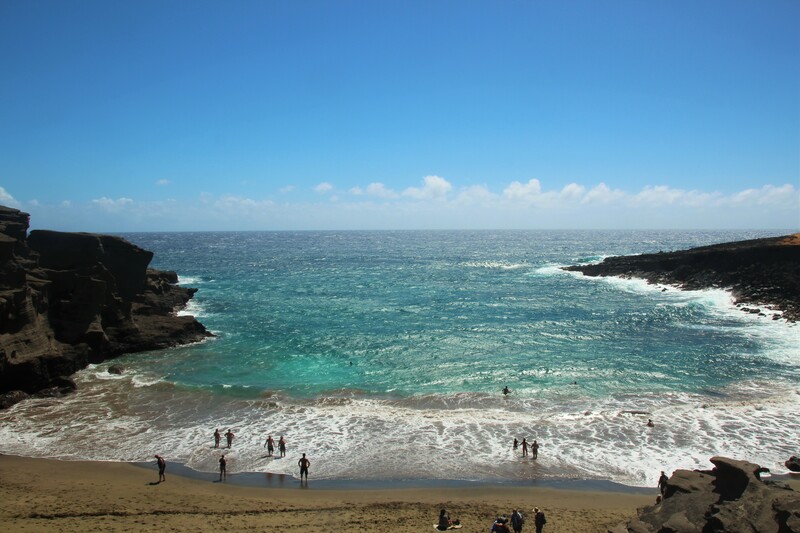 The Green sand beach is located west of South Point of the island and is one of the isolated beaches that is not easily accessible by your rental car. While researching about beaches before our trip, I was truly fascinated to visit this beach due to the color and was very much looking forward to see it in action. If you are driving from Kona city, it takes around 2 hours to reach the southern most tip of the United States. You will need to hike 5 miles round trip through the lava fields that starts from the parking lot to the green sand beach. There are local transportation available at the parking lot for a fee of 15$ and this is more of a group ride in a van. If you’re going on a sunny day, keep in mind that it is usually quite windy in this area, which blows up the dust. Since we had limited time, we did not hike and took the local transportation van. While travelling in the van we observed there were no clear signs or maps to follow the pathway to the beach. The hiking trails were not clearly marked and would be slightly challenging for a person new to the island. The trails are so close to the ocean but very rugged with lava rocks throughout the route. 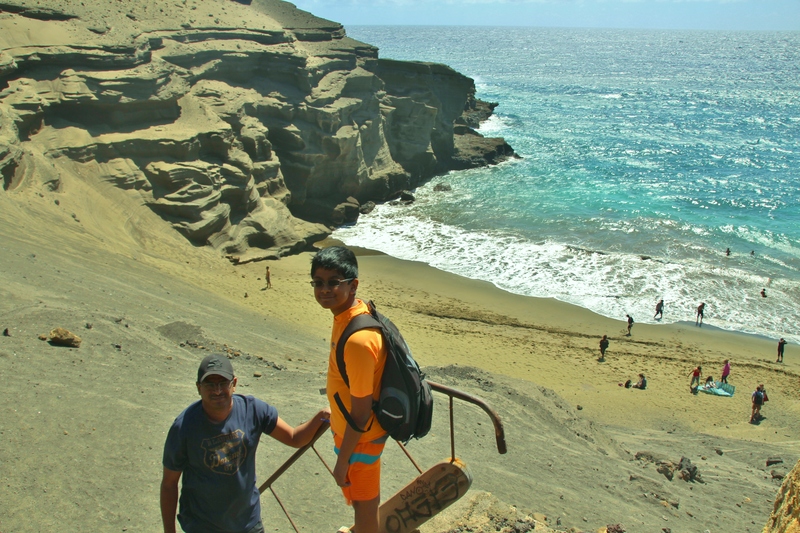 Whether you hike or take the local transportation, you’ll be get to experience one of the best views on the Big Island once you reach the beach. The scenic views are so stunning and the beach is located against the background of steep cliffs and boulders. The color of the sand is so beautiful to see under shades of sunlight. The sand is actually a green olive color caused by eruptions from what was once a volcano. You will notice the beach placed in between a volcano scoria cone filled with green sand. To get down to the beach, you’ll have to hike down a low sea cliff. Please watch your step when climbing down the cliff. The water appears calm, but currents are often times not predictable to spot, so it is best to stay close to the shore if you plan to swim here. 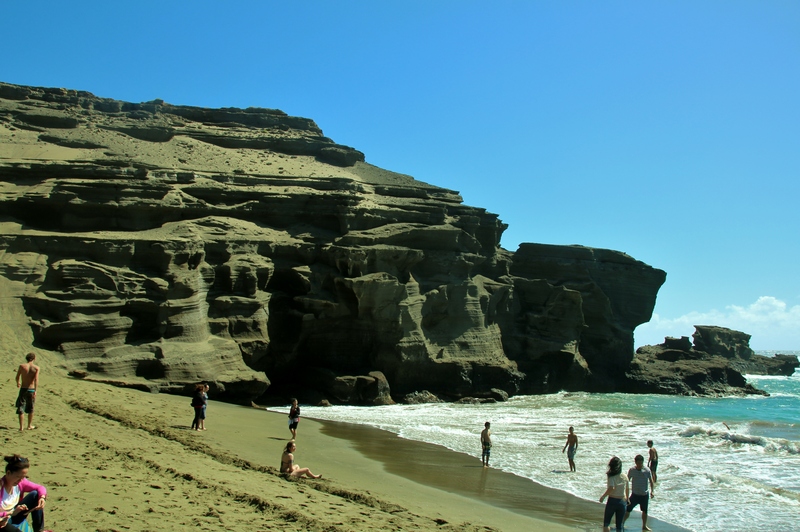 Green Sand Beach is also named as Papakolea. This is truly a unique place and one of only two green sand beaches in the world. 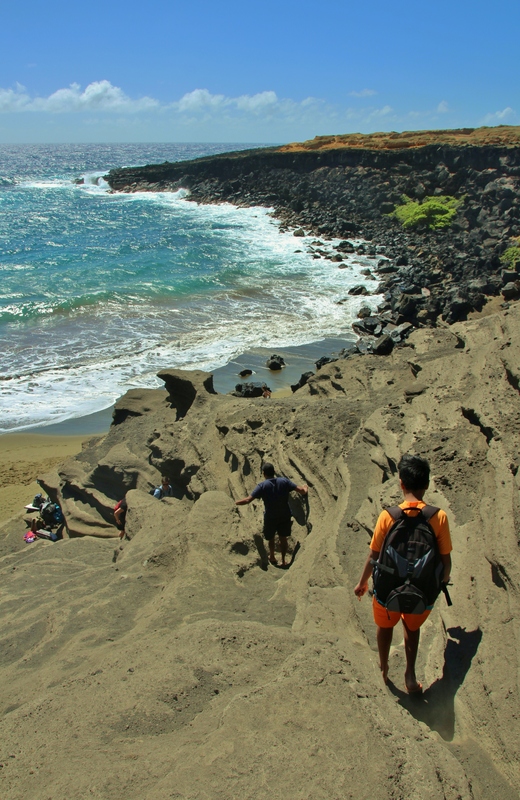 A visit to Papakolea Beach is a full-day trip indeed, so plan ahead. The hike will be great if this is your only day time activity as you will need close to 2 to 3 hours just for the hike alone. Green Sand beach is located at Mahana Bay, three miles northeast of South Point, the southernmost point in the United States. At the end of the paved South Point road to Ka Lae take the road to the left and park at the end of the road. This is the first parking lot, which is about 5 miles away from Papakolea Beach. 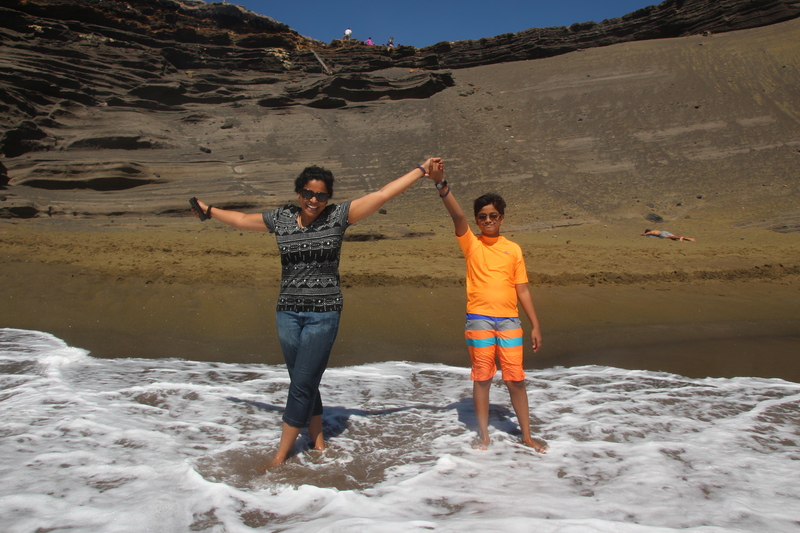 One Response to "Green Sand – Papakolea Beach"